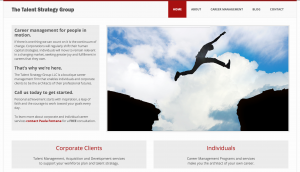 This week we released a new template-based WordPress website for Paula Fontana of the Talent Strategy Group. Paula has started a new business focusing on helping both companies and individuals through employment change. Her unique style and years of experience will make her an asset to anyone faced with career management needs here in CT. In launching a new consulting business, I needed someone who “got me” and understood the impact that my services would have on people considering or already in a career transition. I needed this site to be simple to navigate, “worry free” and inspiring. Scott and his team did a wonderful job translating my business objectives into a fresh, crisp site that resonates confidence and ease of doing business. What a wonderful customer experience! Thank you, Scott! Well, thank you, Paula! It was a fun project for us, and we look forward to being part of your team in the future.